Over Christmas I have been playing around with a simple modification that transforms the QCX into a Class-E driven SSB transceiver. 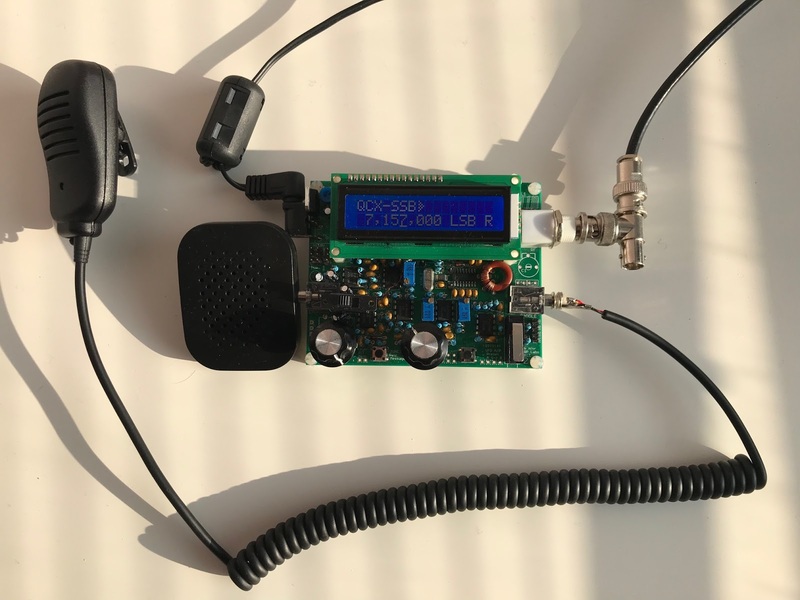 With this setup I have been able to make several SSB contacts and FT8 exchanges across Europe and so far this experiment is working reasonable well. It can be fully-continuous tuned through bands 160m-10m in the LSB/USB-modes with a 2200Hz bandwidth, provides up to 5W PEP SSB output and has a software-based full Break-In VOX for fast RX/TX switching in voice and digital operations. The SSB transmit-stage is implemented in a completely digital and software-based manner: at the heart the ATMEGA328 is sampling the input-audio and reconstructing a SSB-signal by controlling the SI5351 PLL phase (through tiny frequency changes over 800kbit/s I2C) and controlling the PA Power (through PWM on the key-shaping circuit). In this way a highly power-efficient class-E driven SSB-signal can be realized; a PWM driven class-E design keeps the SSB transceiver simple, tiny, cool, power-efficient and low-cost (ie. no need for power-inefficient and complex linear amplifier with bulky heat-sink as often is seen in SSB transceivers). An Open Source Arduino sketch is used as the basis for the firmware, a hardware modification bypasses the QCX CW filter and provides a microphone input in-place of the DVM-circuit; the mod is easy to apply and consist of four wires and four component changes and after applying the transceiver remains compatible with the original QCX (CW) firmware. The following code can generate SSB modulation just by controlling a PLL carrier. I have applied this method on the RapsberryPi PLL, and made several contacts on 40m and 20m band with my RaspberryPi. 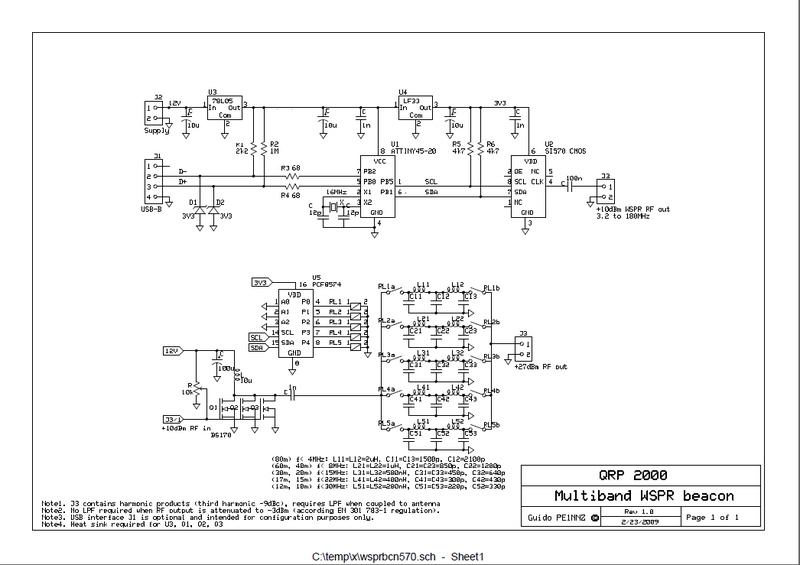 The original idea (as seen above) was to implement a complete SSB modulator and demodulator with software in a ATTINY45 micro-controller chip and a AD9834 as DDS. The software samples microphone signal with ADC and then derives the amplitude and phase of the audio signal. The amplitude and phase extraction is derived from the in-phase microphone signal and its 90 degree phase shifted quadrature signal (created by a Hilbert transform on the in-phase signal). The resulting phase is replicated on the oscillator signal of the DDS, and the amplitude information is used to change the drive-strength (current) of the DDS. The output of the DDS is representing a clean single side-band output SSB near the configured frequency. To proof this idea is working, I implemented the algorithm on a RaspberryPi. In the RaspberryPi setup there is no DDS, but there is a digital-PLL on the micro-processor SoC which we can use for RF generation. By manipulating the Integer and Fractional dividers, a frequency can be generated from 0 to 250 MHz on GPIO4 pin with a resolution of about 20 Hz at 7 MHz. 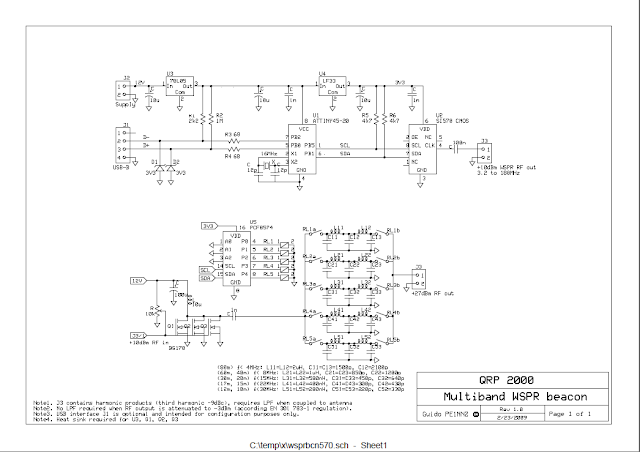 By alternating the Fractional divider between two nearby values, the resolution can be further increased to micro-Hz level; for this a 32 bit clock at 32 MHz is used to generate a PWM alike switching pattern between the two Fractional divider values. The PLL oscillator can be phase modulated by short manipulations of the configured frequency. Increasing the frequency temporarily and then restoring to its original frequency, will shift the phase upwards, while decreasing the frequency temporarily will decrease the phase of the signal. The amplitude signal can be applied by changing the drive-strength of the GPIO4 port, which has 8 levels with a dynamic range of about 13 dB. After some experimenting, amplitude information can be completely rejected, instead the frequency must be placed outside the single side band (e.g. placed to center freq). In this case single side band is generated wihout suppressed carrier, i.e. a constant amplitude envelope is applied (good to prevent RF interference). In this case the audio quality does not seem to suffer from this constant amplitude, and the audio quality becomes even better by applying a little-bit of noise to the microphone input. My impression is that using SSB with constant amplitude increases the readability when the signal is just above the noise. #define RESET 15 // Pin - connect to reset pin (RST).